New LED license plate lamps are a great way to spice up your BMW and give it that great look when you’re driving it around at night. This LED license plate lamp will fit most BMW vehicles with either the basic standard incandescent bulb or the 2-piece OEM LED license plate light. As you can see, the LED license plate light installed on this BMW F30 3 Series looks extremely bright and completely illuminates the license plate for a nice and vivid glow. 1.) 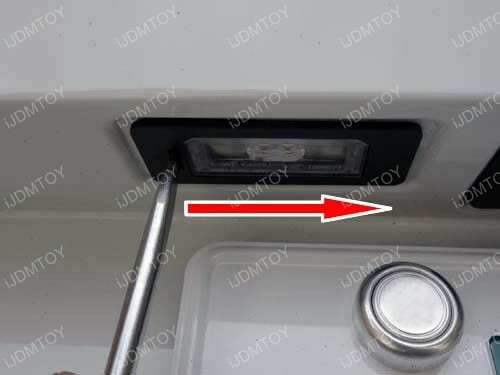 Use a flat head screwdriver to open the license plate lamp cover from the indentation on the left side. You would have to shift the stock license plate cover over to the ride side in order to release the tabs.